Swing, slide, climb, spin, and glide are all fun things for children to experience while growing up. As most childhood experts agree, play is essential for proper childhood development, encouraging social, physical and psychological functioning for a healthier childhood. Playful behavior is known to have positive effects on the brain and also helps a child's ability to learn. Providing children's play equipment and providing play spaces in your backyard helps encourage play opportunities for children to be able to learn. Our range includes outdoor DIY boxed play sets with lots of climbing elements included and we also have Australian made larger play sets that are suited for older children to be able to play on. Special needs Residential outdoor play equipment range. Lookout Tower Play Centre - backyard play equipment for residential useWhat a fantastic playground f.. 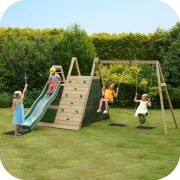 Plum Climbing 'Cube' Play Set - Great climbing outdoor play set for your backyard.Are you want.. Plum Climbing Pyramid Play Set - Climbing Pyramid Wooden Play Set - A Great Playground for your back.. Plum Kids Outdoor Wooden Teepee Play Tent (also known as a wooden Teepee playhouse) E.. Timber Play Set PK1 Backyard playset - Great outdoor playground playset for your bac.. The Plum Toddler Tower Wooden Play Set has been designed for infants and is the ideal all-round..
Not just for Play! The 'Stained' Up & Over play Climber allows children to develop grip and..
Not just for Play! The un-stained Up & Over play Climber allows children to develop grip an..